Oakland’s employee compensation database is the kind of public record that should be proactively available, even with historical versions, without requiring a formal public records request. But since I couldn’t find it online, I filed a request, and got to interact for the first time with Oakland’s very cool RecordTrac system for handling those requests. RecordTrac is a Code For America fellowship project that launched a year and a half ago, and it ensures the entire process is online and publicly available, so users can see every request that gets filed and what response it received. The value of that system becomes obvious pretty quickly after you start using it. For example, when I started looking through the compensation database, one fact that jumped out immediately is that some Oakland police officers make significantly more than their base salary in payment for overtime work. In fact, the highest paid Oakland government employee in 2014 is a police officer who got some $165,000 in overtime pay. What could possibly be going on with overtime at OPD? Searching through the public requests database turns up another person’s request, specifically covering OPD and overtime. Those documents were released in the last few days and are immediately available to me and any other interested member of the public. That’s incredibly helpful to both me and the city. I get the records I’m looking for much faster, and can send follow-up requests without waiting for another round trip, and Oakland doesn’t have to process as many duplicates. It also comes in handy where there are no responsive documents. Traditionally those requests don’t see a lot of publicity because, well, there are no documents to report on. But sometimes their absence is an interesting data point itself. Take, for example, this request for agreements between the Oakland Public Library and law enforcement on disclosing patron information. It would be a much larger story if there were agreements like that, but it’s nice, too, to be able to refer to the request turning up no responsive documents. 1After I tweeted about this request, the Oakland Public Library reached out to emphasize its opposition to that sort of agreement. If all this seems familiar, it may be because services like Muckrock, where I’m a frequent user, have implemented the same kind of thing on the requester end. Every request gets a permanent URL, where all associated documents are connected and made publicly available. Like RecordTrac, it keeps the status of requests updated, and notifies requesters when new information has come in. 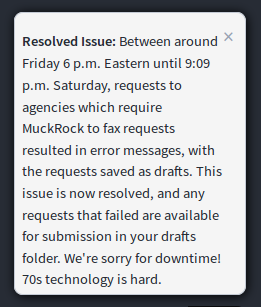 Muckrock definitely makes the public records experience better, and has built an impressive collection of returned documents. But there’s an emergent property of the agencies themselves putting all that information online in the first place. Oakland was lucky to pilot this program, and the avalanche of requests related to Occupy likely taught the city a lesson about handling them efficiently. RecordTrac is already free software, and as of about six months ago, the developers rolled the software into a hosted product called NextRequest. (UPDATE: the main RecordTrac developer reached out to clarify that NextRequest is not affiliated with the original team. Apologies for the error, and I too hope governments embrace the more open solution.) Hopefully that means more pickup by agencies and governments, bringing a much-needed update to the public records requesting process’s usability and transparency. It can be funny to see Muckrock joke about how dated much of our country’s FOIA infrastructure is. But it’d be better to see it fixed. 1. ↑ After I tweeted about this request, the Oakland Public Library reached out to emphasize its opposition to that sort of agreement.